Here is a collection of baking and cooking recipes using leeks as one of the ingredients. This page will be updated on regular basis. 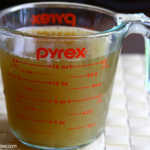 A simple recipe to make flavoful vegetable broth at home. It's easy, cheap and healthy than you can get it from the store.